After the end of the Gibraltar tournament on January 31, my schedule of February and March has been rather light. But it allowed me to recharge the batteries and to train more deeply, before to dive into an 8-month period, between April 20 and Christmas, which I expect to be the most intense in my career. But I won’t be alone here, as a lot of my colleagues will also have to go through the same agenda! That’s because of an international calendar which could not be harmonized, and forces us to play all FIDE tournaments (Grand Prix, World Cup and Grand Swiss), all Grand Chess Tour ones, as well as private tournaments and French Team Championships, between end of April and December! It began on April 4, when I spent the day with an Eurosport crew for a TV shoot, which should be on air pretty soon. 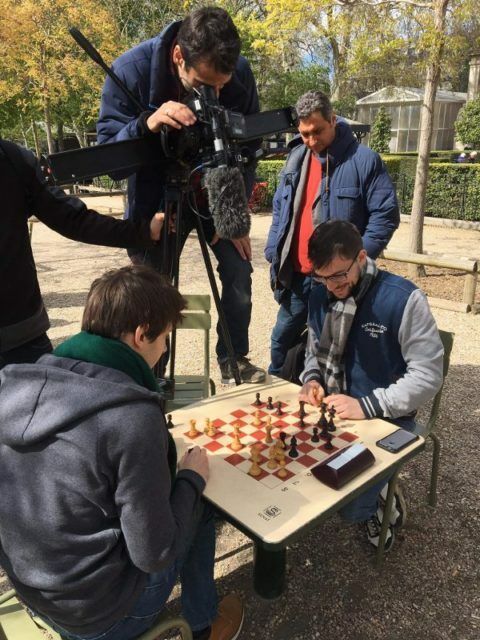 Blitz sequence for Eurosport, filmed in the Jardin du Luxembourg (Paris), with GM Jules Moussard (photo : 7L Brand Agency). Next day at noon, I caught a flight for Düsseldorf, as I had to join my Baden-Baden teammates some 30 kilometers further, in Solingen, for the last Bundesliga weekend of the season. The decisive match against Solingen was precisely scheduled on the afternoon of Saturday. Until there, Hari had followed my game against Anand, played last year in Grenke Chess (1-0, 39 moves). Maxime on the verge of playing 23.Qb3+! (photo : Guido Giotta). Unfortunately, I played badly in the technical phase. I wanted to avoid complications and any hint of black counterplay, but in doing so, I let him come back into the game, until a moment when he could force a clearcut draw, which he missed! 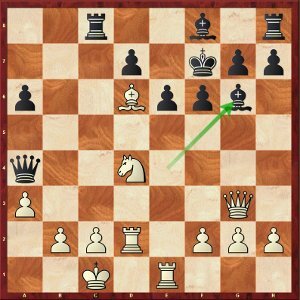 Here, black’s last chance was 57…Kg7 58.Ne5 Ra5+ (58…Bc8? 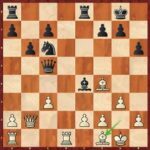 59.Rg6+) 59.Kd6 (59.Kd4 Bc8 60.Rg6+ Kh7 61.Rxg5 Ra7! and the pawn on c7 falls) 59…Bc8 and the outcome remains unclear. In contrast, after Hari’s choice 57…Ke7?, I was able to play the simple 58.Rg6 Ra2 59.Rxg5 after which I was almost certain to win, especially when seiing my opponent becoming more and more feverish (1-0, 67 moves). So we won against Solingen, and the next day, we had to confirm against a theoretically weaker team (Düsseldorf), in order to guarantee the Bundesliga title. A match which gave me the opportunity to play against a chess legend for the first time in my life, Jan Timman (2549), still active at 67. Here instead of 29.g4 or 29.h4, Timman chose the catastrophic 29.Qb3? which loses material. It is not obvious at first glance, but after 29…b6 30.Rb5 (30.Rc4 Kh8! and white shouldn’t survive the threat 31…f5) 30…Qc6!, the pin on the long white’s diagonal happens to be decisive. The game ended after 31.Rb4 (31.f3 Rxe4! followed by 32…Rd2+ and 33…Qd7 with a mating attack) 31…Kh8 32.Kh2 f5 33.Ng5 Rd2! 0-1. Once again champion of Germany with Baden-Baden! 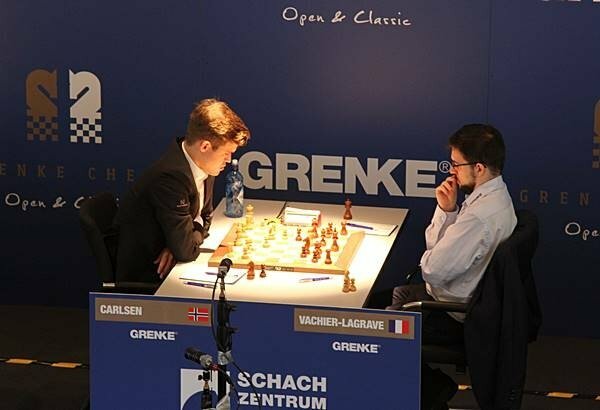 (photo : schachbundesliga.com)). The calendar being what it is, www.chess.com couldn’t find an ideal date to fit its first online Bullet Championship. It finally took place at the same time than the last Bundesliga weekend, though in the evenings. Bullet, especially without increment, is a merciless format (one minute each KO). It puts the emphasis on calculation speed, use of the mouse, and « premove » science! (ie. anticipate one’s own move before to see the opponent’s one, in order to win extra time). Therefore, hierarchy is not necessarily the same, and real Bullet experts, like the Ukrainian Oleksander Bortnik or the young Iranian prodigy Alireza Firouzja, have earned their place in the 8-player final bracket. Final bracket of the first online Bullet Championship. My « real » Saturday game against Harikrishna had been quite a long one, so the time left was scarce in order to be in my room for my scheduled ¼ final match against GM qualifier Federico Perez Ponsa, from Argentina! Just enough time to have a quick bite and I won very narrowly in overtime (8.5-7.5). Later in the evening, I played Bortnyk in the semi-final. I already had the opportunity to play Bullet series against him a long time ago, with a very tiny overall lead. But maybe this very long day of chess was a bit too much  and I lost the match 12.5-16.5. 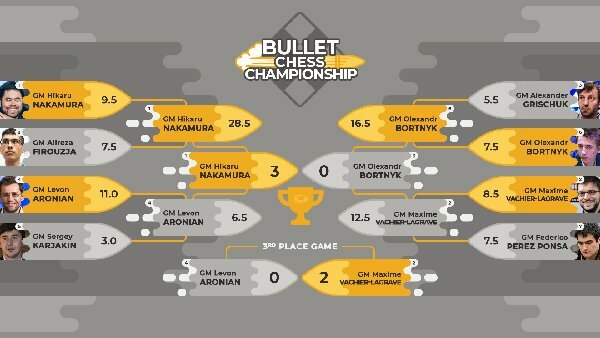 The next evening, after having completed the Bundesliga weekend, my follow-up was the Bullet Championship third-place match against Aronian, played best of 3 sets of 6 wins. I won (6-2, 6-0) while a few minutes later, Nakamura easily clinched the title against Bortnyk (6-1, 6-2, 6-1). It was time for me to go to bed, because the Marathon was not over yet! The next morning, I had to travel to Gonfreville l’Orcher, near Le Havre, where I was expected to attend the closing ceremony of their 50th International Open, and then give a simultaneous display on 28 boards. 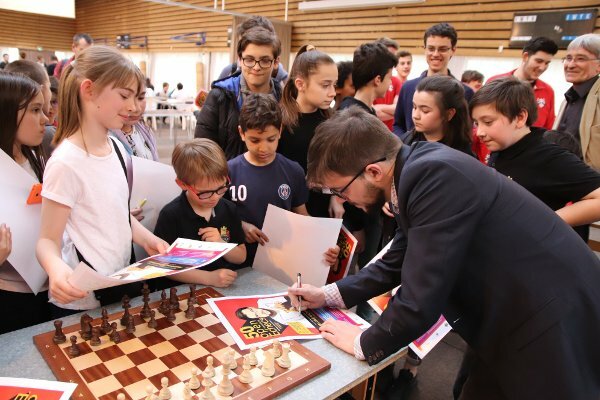 Under the leadership of Cyrille Vaugeois, the sympathetic Norman club is renowned for its organizational abilities, and I could indeed witness it with my own eyes when I came to Gonfreville as a spectator for the 2016 French Youth Championships. Signing session after Gonfreville l’Orcher simultaneous (photo : Cyrille Vaugeois). After the signing session, the cocktail, and the unavoidable night blitz games, I was taken back to my hotel and could enjoy a well-earned rest, after five intense days! Playing an online chess tournament is not always easy. You need a reliable connection, a good mouse, a quiet environment… Playing from an hotel abroad doesn’t necesarily help either. Yet this is what Maxime’s Bundesliga teammate Levon Aronian and himself had to do from Solingen’s Hotel Maritim lobby, in order to play the Bullet Championship. Having both lost their ½ final match, they were supposed to meet for the third-place match the next day. Fortunately, they were able to avoid an online duel 2 meters away from one another – which would admittedly have been funny – as Maxime had booked an hotel room at Düsseldorf airport, to be sure not to miss his plane on the next morning (6,40 am ! ), and to reach Gonfreville l’Orcher on mid-day! 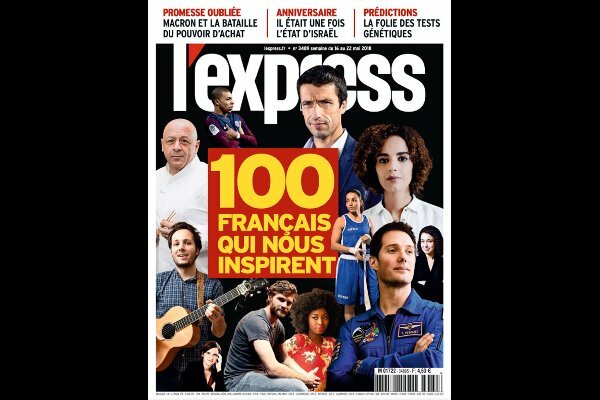 L’Express is one of the biggest french magazines. Incidentally, it celebrates its birthday this very week. As soon as november of its first year (1953), the weekly already published a « list of 100 », which offered a review of the hundred french people « who map out roads for the future ». In 2018, L’Express does it again to mark its 65 years of existence : only differences with 1953, parity is respected, and the political field has been excluded. As Guillaume Dubois, L’Express Director, states, the main purpose is to « bring to the fore French men and women who […] believe in their own future and in their country’s future. Coming from a broad range of areas, « reflecting a diversity of careers, of jobs, of sensitivities, and of origins, […] [the 100] are acting », he adds. And among them, in the section of « Those who act to surpass themselves », you will find Maxime ! Do we have to see a symbol in the fact that he’s just next to Thomas Pesquet, the famous astronaut ? 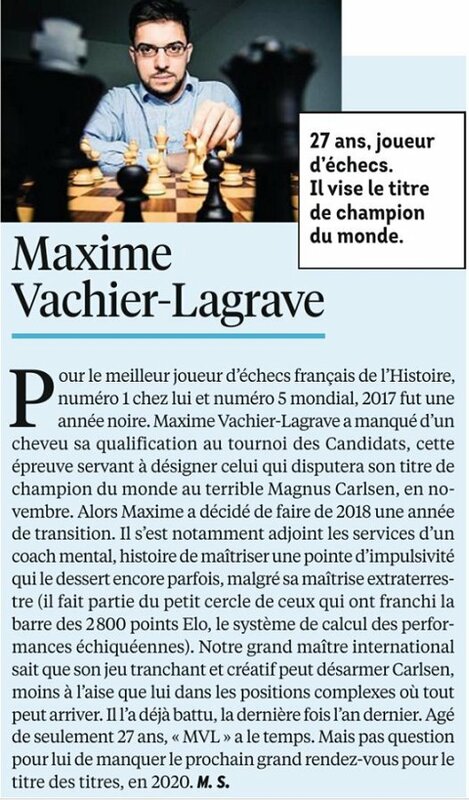 Still, this recognition constitutes a huge incentive, for Maxime will jump back on the campaign trail in 2019, trying to move through the qualifying stages leading to the world championship match. Caption: 27 y.o, chess player. He wants to become world champion. Text: For the best french chess player in history, #1 at home, and World #5, 2017 was a terrible year. 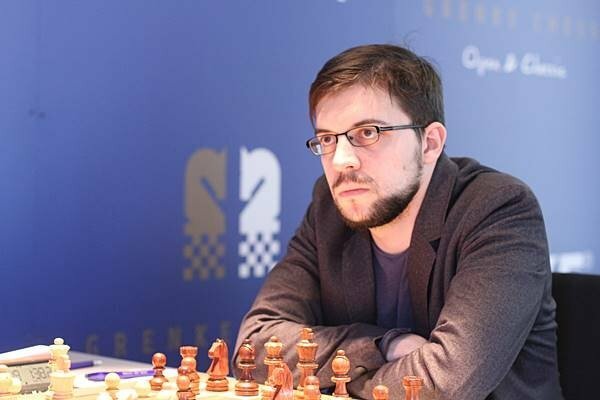 Maxime Vachier-Lagrave narrowly missed a spot in the Candidates, the tournament which selected the challenger of World Champion Magnus Carlsen, for the forthcoming title match in November. Thus, Maxime decided to treat 2018 as a transition year. Among other things, he hired a mental coach, in order to master this touch of impulsiveness which sometimes puts him at a disadvantage, despite his extraterrestrial skills (he belongs to the small circle of those who have reached 2800 Elo points, the method for calculating relative levels of chess players). Our International Grandmaster knows that his creative and sharp play can disarm Carlsen, less at ease than him in complex positions where anything can happen. Maxime has already beaten him, last time the previous year. At only 27, « MVL » has plenty of time ahead of him. But it is out of the question to miss the next opportunities of reaching the « title of titles », in 2020. Titled tuesday There’s no way we would miss on this website games played by Maxime ! Thus, let’s have a slight month-long flash back, to revisit the « Titled Tuesday » tournament organized by www.chess.com. As its name indicates, this online blitz tournament takes place once a month on Tuesdays, and is restricted to titled players. Maxime played in the April 17 Titled Tuesday, probably the strongest one so far, with tens of GM’s around. 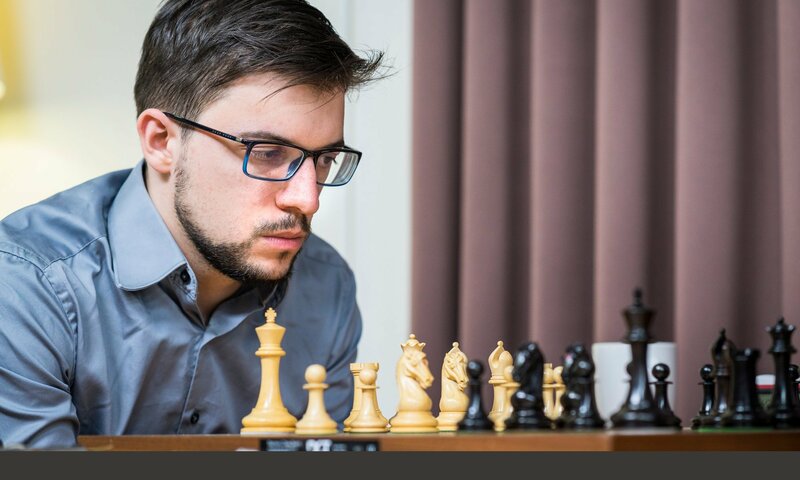 The fact that an Argentinian FM prevailed, before to be banned from the website soon afterwards, contributes to global suspicions over the fairness of online chess…On his part, Maxime first crushed the competition, with 7/7 against 6 GM’s (! ), before to give up two draws, and ultimately lose the decisive last-round game because of a huge blunder, even if not without finding ways to fight back (see Viewer below). It’s the second time the Bundesliga gathers in the main room of the Berlin Maritim Hotel, very close to the center town. 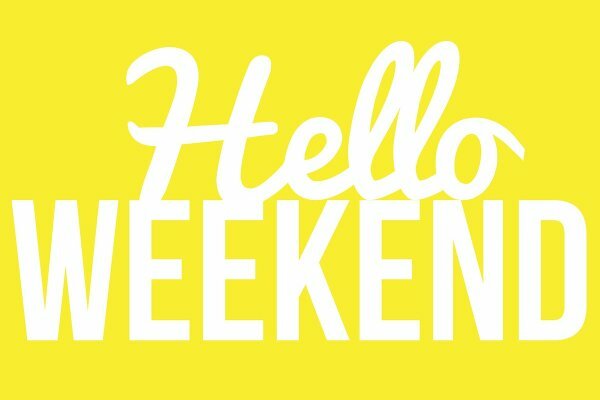 With sixteen teams around playing the last three rounds of the year’s championship, it can be said that this long weekend was the culmination of the year, a kind of huge chess party. 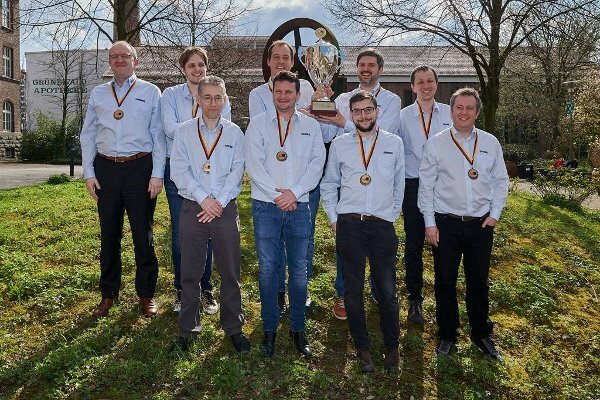 In sporting terms, we (Baden-Baden) began the final weekend head to head with Solingen, with the hope of winning this long_distance affair in one of the three rounds. 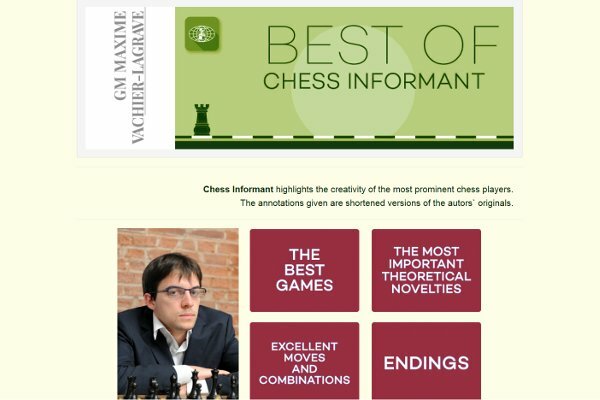 Chess Informant is a real institution for chess players. The older ones will remember that during the pre-computer era, the Informant was awaited like the Messiah. This compilation of the semester best games was indeed the main source of informations on the latest developments of opening theory. After a quick taxi transfer beetween Karlsrühe and Baden-Baden during the rest day, I took residence in a town and an hotel that I get to know pretty well ! The next day, I approached my game against Carlsen half a point ahead of him, but with black. I didn’t really expect him to enter this variation of the English opening ; especially since after the game, he said he had something special in mind, which he finally didn’t play. I don’t know what happened exactly, because he looked rather well prepared in this variation, which requires to remember very specific moves. I had already analyzed the exchange of Queens, a new try for white, and his later choice of sacrificing a pawn by 17.d6+ Kxd6 18.Rad1+ Ke7 19.Be5 wasn’t an easy follow-up to find, but it was certainly the best practical chance. 17.d6+, the best practical chance for the world champion. Thanks to this good prep, I never left my comfort zone, though it was not so trivial to keep things even. Observers might have expected more suffering from me against Magnus, who loves that kind of endgame, but I feel I found the precise moves to neutralize him rather quickly ! 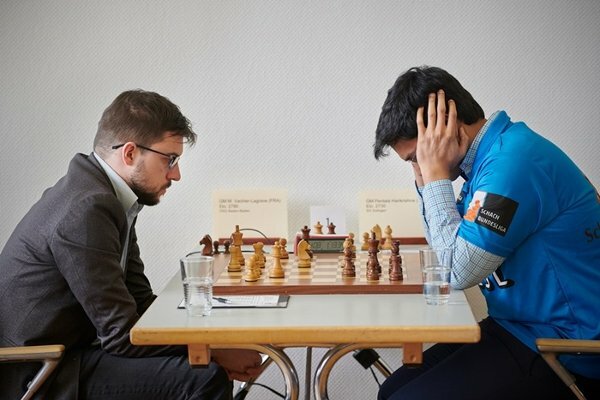 Facing Magnus… (photo Grenke chess). 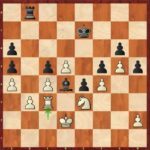 I arrived at the board with a fresh idea in the anti-Marshall (12.h3), but unfortunately, I reacted badly to his manoeuver …Qb8-b5, which I hadn’t anticipated. Instead of 14.c4, I should have played 14.Be3, a move I rejected because of 14…d5, but 15.c4! would then give white an advantage, because the compensation for the pawn is huge after 15…dxc4 16.dxc4 Qxc4 17.Nbd2. Later, I was happy to find this little tactic 19.Nxe6!, though in the end, it doesn’t bring a lot ! 17.Nxe6!, spectacular but not as strong as it looks. 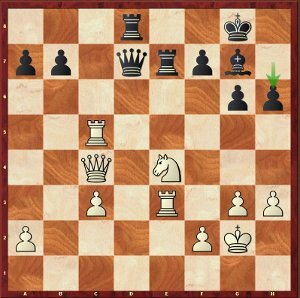 At the end of the tactical sequence, he uncorked the excellent 25…g5!, which looks anti-positional but locks down the position. I should have tried 26.Kh2 (idea 27.Rg1) 26…h6 27.h4! in response, as Levon mentioned after the game ; white can still continue to press, but it probably wouldn’t have been enough against an accurate defense. Once again, I could deliver a new idea, this time in the Neo-Grünfeld with 5.Qa4. 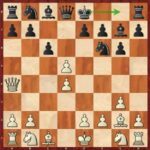 An early and very interesting pawn sacrifice (6…0-0!? 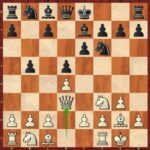 ), regrettably spoiled by an idiotic move, played too impulsively, 14…Rfd8?. 6…0-0! ?, the proof that you can still find novelties as soon as move 6 ! I completely forgot that after 15.Rf1 Nd3, white was not forced to play 16.h3 Be6 17.Nd4 which leads to a draw, but had the strong 16.Nb3! at his disposal, after which I had to suffer for five hours before to salvage the draw. Instead of 14…Rfd8?, 14…Nbc4! would have prevented white to establish a Knight on d4, and after 15.Nxe5 (15.Nxc4? 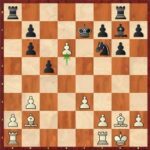 Nxf3+) 15…Nxe5, black has adequate compensation for the pawn. Afterwards, I think I defended rather well the difficult position, but I could have spared myself sixty additional moves ! Against Vitiugov, just before the novelty 6…0-0!?. 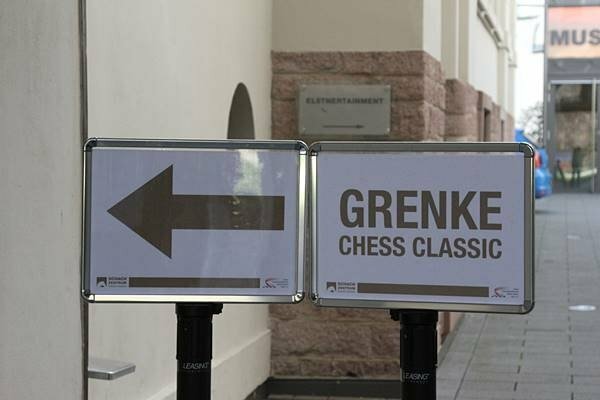 (photo Grenke chess). Against Fabiano, I decided not to face his new weapon, the Russian defense. But I didn’t expect him to play the …Bb4 variation of the 4 Knights English. I took time to decide how to react and how to handle the position, the more so as my theoretical memories were a bit distant ! After hesitating quite a lot, I finally chose one of the safest lines, 9.Qc2, which is obviously also one of the less ambitious ones. By the way, I had forgotten during the game that the theoretical reference after 11…Bf5 was a game of mine ! 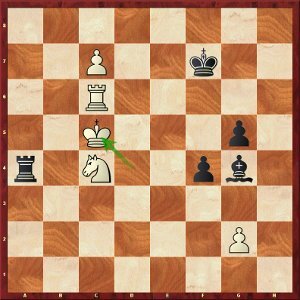 (against Van Wely in 2008, draw in 37 moves -Ed.). Anyway, I quite liked my position after the opening, and that’s why I tried 14.Qb2, followed by the unorthodox 17.Bf1! ?, to try keeping the Bishop pair in the long run. 17.Ff1! ?, an unorthodox try to keep the Bishop pair. But I lost too much time immediately afterwards, with two moves in a row which didn’t fit together, 18.a4 and 19.Rac1 ; I could have played 18.a4 and 19.Qb5, or 18.Rac1 and 19.c4, perhaps even 18.a4 and 19.c4, but not the combination of moves I chose ! Actually, in the course of the game, I underestimated the strength of 20…Qf5! because I hadn’t anticipated 21…Qc5+ at the end of the variation. Thus I was adequately punished, as Fabiano could even choose beetween the actual 22…Bd5, which does the job, and 22…Bxf3+ 23.exf3 Qf2!, which also wins. Of course, this game remains a disappointment, and that day was clearly not mine, but it is no disaster either ; I just tried something different in the opening, and it backfired. 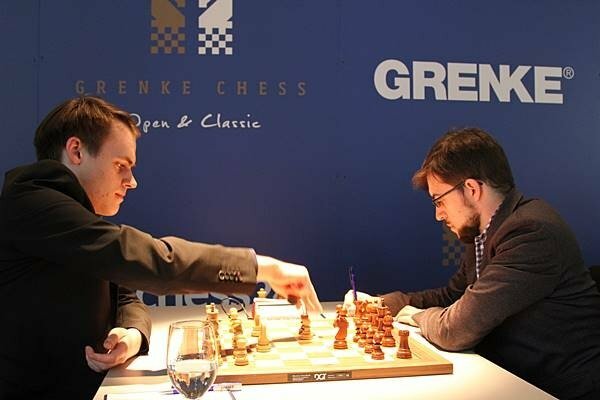 The young german player Bluebaum is about to take on d5 in the opening (photo Grenke chess). I didn’t really anticipate to face this brand new fashion line in the symetrical English, with 5.e3 and 6.dxc3, which is no great danger to my mind. I even thought he was going to exchange all four rooks at move 18, leading us back home very promptly ! With his move 18.g4! ?, he gave me new hopes of creating something, but it wasn’t to be enough. At the end, I must say I’m not that far, but he still holds an impregnable fortress, because not enough lines are open in the position. 42.Rc3! completes the fortress ; the exchange will be worthless in this blocked position. There again, with white, I wanted to change. I was rather pleased with the position which came out from this atypical Reti opening, with my rare 6.Qd3 opposed at his early …b5 ; indeed, there was room for creating imbalances, against a black setup which looked a bit passive. 6.Qd3! 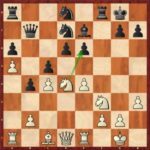 ?, once again an original position on move 6 ! I must confess that Georg reacted pretty well, proving that he knew that kind of setup and its ressources. He succeeded in playing the freeing 21…c5, even though I thought I could reduce his pieces to extreme passivity with my pawn sacrifice 22.Rec1 cxd4 23.Qd3, in particular with the Nb8 which could hardly move. But in this kind of dynamic equilibrium, I was the one who ultimately found himself in bad shape, because of my try to force events with h4-h5… At the end, I had to be precise to earn my half point. 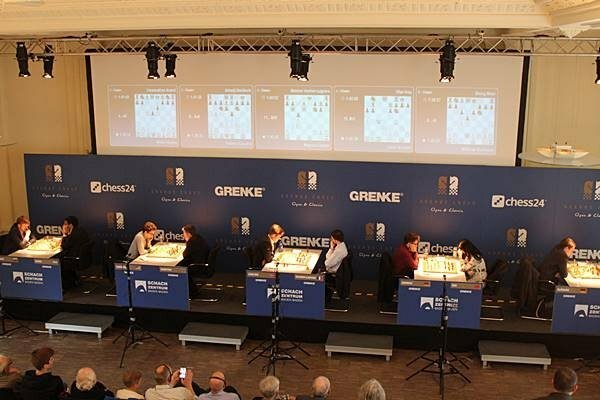 The Grenke Classic scene in Baden-Baden (photo Grenke chess). All in all, I would define this tournament as a sort of dress rehearsal one, with an average result at the end, but very interesting games, which is rather good news in view of the season’s follow-up. However, I was suprised to lack energy at the end ; I was rather expecting to struggle at the beginning of the tournament to find my form. Kudos to Fabiano for the impressive achievement of scoring twice, Candidates and Grenke ! 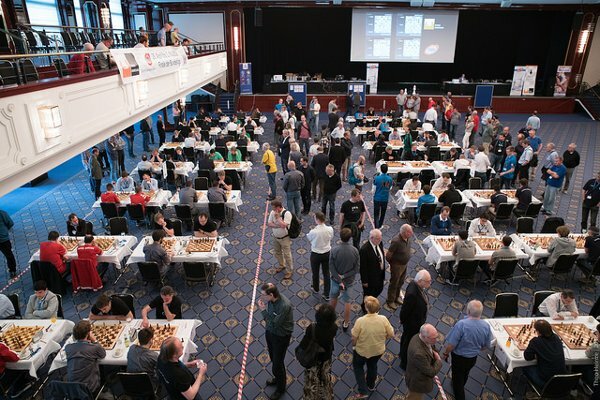 Next rendez-vous, the Norway Chess in Stavanger, with the opening blitz on May 27, and the tournament from May 28 to June 7. Take me home The rail strikes in France didn’t interfere with Maxime’s travel for the Grenke tournament in Germany. Indeed, he took the train for his outward trip just before the strikes began ; and as for the return path, it was scheduled on Tuesday, April 10, a right timing as this day was spared by the union calendar… But others in Baden-Baden weren’t that lucky, although they were not heading towards France ! It turns out that the ground staff of four huge german airports, including the nearby Frankfurt hub, were on strike that day, forcing Lufthansa to cancel more than 800 flights ; among them were numerous long haul ones that some of the players were supposed to catch in order to fly back home. About star chess24.com commentator, IGM Jan Gustafsson, who had planned to fly directly to Thailand in order to play in the Bangkok Open, he lamented himself during the last round show, unable to know if he would be able to make it to Asia the next day !